Borosilicate is the material of choice for many industries because of its affordability — especially the biomedical and research industries. 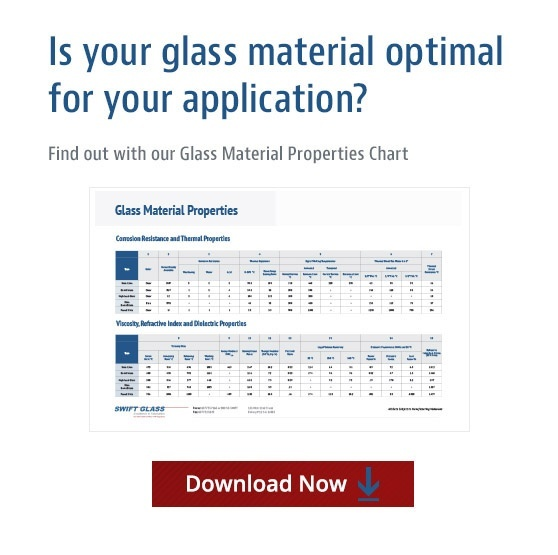 Borosilicate glass remains both clear and strong when exposed to high temperatures. In addition to standard borosilicate, Swift Glass also offers infrared reflecting borosilicate (IRR Borosilicate), also commonly known as a hot mirror. A hot mirror has an Indium Tin Oxide coating on one surface, which is transparent to the visible spectrum and reflects a portion of the infrared spectrum back at the light source. This is mostly used in the high heat environments to protect the interior components of cameras, film in projectors, colored lenses or even people from heat caused by intense light sources. Borofloat® glass is a clear and transparent colorless glass. Its excellent transmission and very weak flourescence intensities over the entire light spectrum make it ideal for a wide range of applications in optics, optoelectronics, photonics and analytical equipment. Borofloat® offers outstanding thermal resistance, exceptionally high transparency, high chemical durability and excellent mechanical strength. BK7® glass is an extremely common crown glass used in precision lenses. BK7® performs well in chemical tests and no special handling is required. Pyrex®: Because of its borosilicate composition, Pyrex® code 7740 glass resists attack by all acids except hydrofluoric and hot phosphoric. The low coefficient of thermal expansion allows it to withstand higher temperatures and temperature excursions than ordinary window glass. Pyrex®Flat Glass: Because of its borosilicate composition, Pyrex® code 7740 glass resists attack by all acids except hydrofluoric and hot phosphoric. The low coefficient of thermal expansion allows it to withstand higher temperatures and temperature excursions than ordinary window glass. It features a very smooth surface and low micro roughness. Furnace Observation Glass: Corning’s #5331 furnace observation blue borosilicate glass is a dark colbalt blue glass that is a low expansion glass for added heat resistance in furnace site glass applications. The color is specifically designed to view flame for accurate settings or readings and still protect the viewer from harmful IR and UV rays. Standard: Annular Edge offers a ground flat and parallel gasketing surface used for sealing in a flange. It is annealed for low pressures. It is used where optical properties are not of prime importance. High Pressure: High-Pressure Annular Edge offers a ground flat and parallel gasketing surface used for sealing in a flange. It is tempered for high pressure and high thermal shock applications. It is used where optical properties are not of prime importance. To learn more about how borosilicate fits into your application, contact Swift Glass today.